The third session of Umar Al-Saeed's trial took place yesterday [August 18] in Buraidah, Saudi Arabia. Umar Al-Saeed , a member of the Civil and Political Rights Association  (ACPRA), was detained on April 28  for refusing to attend an interrogation session without his lawyer. As in the second session , Umar Al-Saeed was kept handcuffed. He complained from the pain handcuffs cause, but the judge, Eisa Al-Matroudi, refused to have them removed. The judge asked Al-Saeed, the youngest member of ACPRA arrested so far, about one of the charges, “Criticizing the rulers”; Umar Al-Saeed tried conferring with his representatives. “Why do you need your representatives’ help to answer? Aren't you a man?” The judge provocatively asked. Umar then refused to answer demanding the maltreatment ends. Umar Al-Saeed has complained before from maltreatment  by the interrogator. During trial, one of the attendees, Mohammad Al-Rabiah [@mohad_f ], told the judge it's illegal he asks the defendant and his representatives not to confer. The judge called Al-Rabiah to sit near him and gave him the law of criminal procedure asking him to pinpoint the articles that prevent the judge from doing so. Bayan Al-Bjadi [@Urooobh_ ] and Jinan Al-Ghaith [@JMNG6 ] were not allowed to attend the trial. The officers told them the judge doesn't allow women in and tried to get them to go home. The women refused and waited outside till the trial was over. According to attendees , the judge asked the representatives to demand his replacement saying he wants to leave this case. He was so irritated that he didn't set a date for the next session. No records were signed by the defendant and representatives. 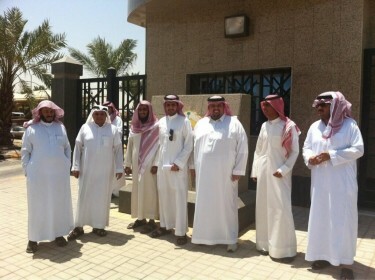 Six more members of the Civil and Political Rights Association remain in jail in Saudi Arabia. One of them, Mohammad Al-Bjadi , was released on August 6  and re-arrested on August 14 for no apparent reason.